Parade Route & Pick Up Location - Please Read Below! 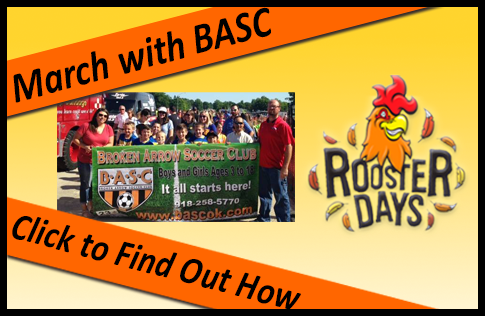 Broken Arrow Soccer Club is excited to be participating in this year's Rooster Day's Parade! We would love for all BASC PLAYERS, PARENTS, COACHES & REF'S TO COME AND MARCH WITH US! Email Cherish if your player or your team would like to join in the fun! Entire teams or just individual players and parents are all welcome! BASC parade participants will lineup beginning at 9:30 AM. The location will be determined by the Chamber of Commerce (coming soon!) Be on the lookout for the Broken Arrow Soccer Club banner! (Coming soon - Click Here for a map of the starting point.) Those marching in the parade will pass out candy & soccer flyers to spectators along the parade route. If your child is under the age of 12, we ask that an adult be with the child while marching in the parade. The parade route starts at ____ (coming soon) Street, goes along Main Street and ends at Mason Drive. If you are not marching in the parade with your child (only if your child is over 12 years old) please pick up your child from the Broken Arrow Soccer Club office (1001 S. Main Street) after the parade is over. The parade route ends at Mason Drive, afterwards we will walk back to the Broken Arrow Soccer Club office located at 1001 S. Main Street. 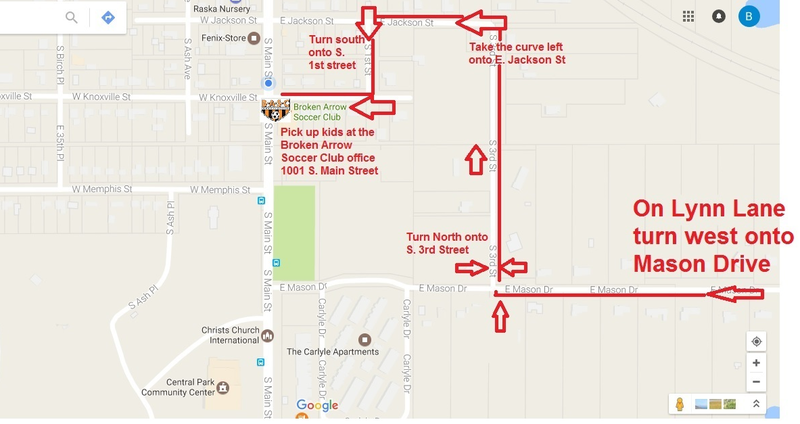 For the parents of kids over 12 who will not be marching in the parade, please read the following driving directions for picking up your kids at the Broken Arrow Soccer Club office after the parade: On Lynn Lane, turn west onto Mason Drive, then turn north onto S. 3rd Street, take the curve left onto E. Jackson Street, then turn south onto S. 1st Street, then turn west onto W. Knoxville Street. You will see the Broken Arrow Soccer Club office where we will meet after the parade. Click Here to print the map or see below. We look forward to seeing you join us for this enjoyable event and believe the kids (of all ages) will have a lot of fun!